If you’re in the midst of wedding planning, then you know there are a million details to keep track of when it comes to your special day. To make things a bit less complicated for their guests, many engaged couples are using a personalized wedding website to share information about their big day in a concise, easy-to-navigate format. While it’s an extra step in the wedding planning process, it can actually end up saving you time since you won’t have friends and family calling to ask about things like directions to your venue and where you’re registered. Plus, there are some great free options for creating custom wedding websites that won’t cost you a dime. Here are five of the best options out there. Perhaps the most well-known wedding website of them all is The Knot. This website makes it easy to create a wedding website for your event with several themes and layouts from which to choose. This is a great option for beginners or those who aren’t as web-savvy since the templates are fairly rigid – you practically just fill in the blanks where you need to. Plus, you can coordinate your invites with the theme of your website. Wordpress is on the opposite end of the spectrum as far as simplicity goes. While you have thousands of customization and add-on options to make the site look just the way you want, you’ll also need to be pretty familiar with the web to use WordPress. There are tons of free themes to choose from as well as paid options that are specifically geared towards weddings. While Wedding Jojo doesn’t have a ton of options for themes and colors, they do have some of the most tasteful free designs available. If you’re less worried about customization and just want something with a beautiful, artistic look, consider using Wedding Jojo to create your personalized event website. Plus, it’s easy to include things like password protection, a guestbook and online RSVPs using this option. If you want many of the customization options built right in to your site, check out Wedding Window. These sites all include options for online RSVPs and password protection. There are also a large number of themes to choose from so that you can get the look you want. Wedding Window’s custom wedding pages are also mobile-friendly so your guests can view it on their smartphone or tablet. Users can integrate travel apps into their website so that guests can click to book travel arrangements. Though this business focuses on wedding invitations, you can also create a custom wedding website with Wedding Paper Divas. Naturally, many couples choose this option because the wedding website themes are directly matches with more than 40 of the business’ best-selling wedding invitations. Plus, they offer several popular website features, include online RSVP capabilities. If having lots of theme options is important to you but you don’t want the complexity of an option like WordPress, consider using MyWedding. 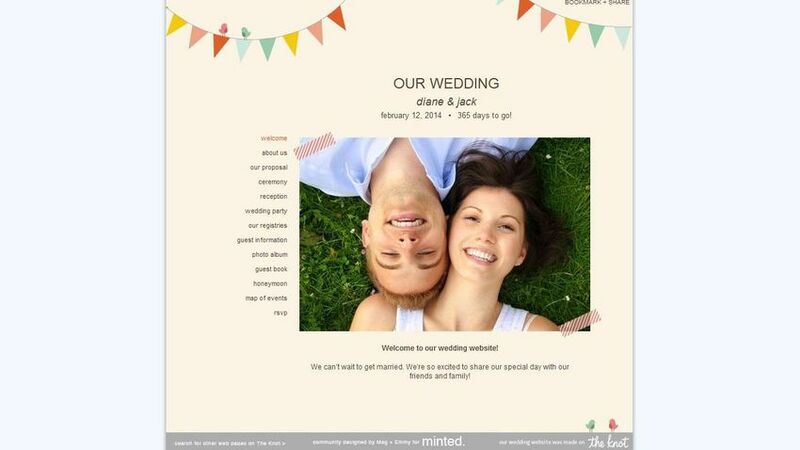 This site offers over 600 template designs, several of which offer an option for matching invitations. In addition, there’s an integrated app that allows your guests to share photos which become automatically added to a timeline on your wedding website. Domain name: If you want a personalized domain name (for example, www.jackandjillgetmarried.com), then you will have to pay a fee. Make sure you find out whether the payment is auto-renewed after the initial number of months or years that you purchased the name for and how to cancel this after the wedding. Invitations: Do you want matching invitations? If so, some sites offer the ability to get paper or online invitations that match your website’s custom theme. You’ll also want to look into whether people can RSVP to the wedding online through your website. Privacy: Some of these options allow you to create a password for your event. Decide in advance whether you want this capability then select a website accordingly. Photos and Videos: Some options will restrict the amount of content that you can store on your wedding website. If it’s important to you to include lots of photos and videos on your page, make sure you choose an option that allows for large or unlimited uploads. Customization: Some websites offer more customization options than others. If you have specific ideas about what colors, fonts, music or images you want to use, make sure you choose a site that allows for more customization. With so many great wedding websites options that won’t cost you a dime, it’s easy to make your wedding information readily available to your guests. Create your wedding website using these free options, or pay for a few important add-ons that make the site perfect for your big day.